TAOISEACH LEO VARADKAR had something of a PR disaster at the Chicago St Patrick’s parade last weekend, while in New York Mary Lou McDonald came in for criticism after she was photographed walking behind a controversial banner. For me, the events prompted memories of a visit to New York in 1983 when I was in the city to report, among other things, on the St Patrick’s Day Parade. It was no ordinary parade that year (it never is: it’s an astonishing and unexpectedly affecting display of the power Irish America wields in the city that never sleeps) the reason being that the Grand Marshall chosen to lead it was Michael Flannery, an 81 year old IRA veteran. This had been done at the behest of Noraid – the fundraising organisation set up to aid the Provisional IRA. Noraid claimed to be helping distressed and needy victims of violence in Northern Ireland, but was always suspected of sending more than money and food parcels. Many Irish and US dignitaries had withdrawn their support from the parade. The Catholic Archbishop of New York also disapproved of the choice of Flannery. This was no small thing: the parade was, after all, in honour of a saint of the church, and it started every year from outside the doors of St Patrick’s Cathedral on Fifth Avenue. It was an unbroken tradition that, after High Mass in the cathedral, the city’s archbishop would emerge through the great doors and pronounce his blessing, this being the signal for the parade to start. As noon approached, the vast parade stood silent and tense along the avenue. The situation was big news in the city, and there were prowling reporters with television cameras and microphones trained on Flannery, the leading colour party – and the closed cathedral doors. The Angelus bell rang its eighteen chimes. Everyone waited. This was high theatre. You could say nothing was happening – but by doing nothing Archbishop Cooke (whose Irish parents had given him the name Terence after Terence MacSwiney) was making a resounding statement. All eyes were on the doors, but they remained firmly closed. They stayed that way until, after a few tense minutes, someone blew a whistle, a band struck up and the parade moved off. The doors did eventually open and those inside emerged to watch the rest of the parade. The Fighting 69th Regiment passed by, the band playing ‘Over There’, the World War I Song written by George M Cohan. I noted that while the veterans looked Irish, the younger soldiers were of several national origins. A whole hospital’s complement of uniformed nurses went by. A man (maybe the same one) shouted “Hello Mary” and a few dozen nurses’ heads turned. Then came Noraid: a hundred or more men and women, all wearing black berets. It was time to get back to my hotel and send a short report back to the newsdesk. But how to get there through the jammed streets? Eventually, a few avenues away, I found a cab. The driver told me he was from Turkey and had arrived in America that January. I commented on the way the parade had blocked up the city. I found myself explaining to him about St Patrick. “What is saint?” he asked. I told him about this holy man who came to our country to tell the people about God. I was nonplussed. But as we arrived at the hotel I had my answer ready: “Look at it this way … Are you a Sunni or a Shiite?”. In my hotel room the local television news was on. 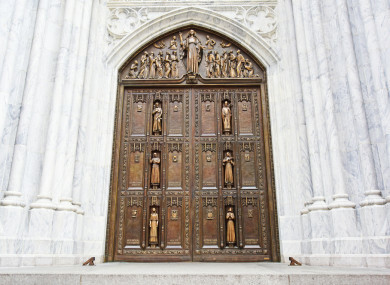 The closed doors of St Patrick’s Cathedral were leading the bulletins on all channels. Email “The year the Archbishop refused to bless the NYC parade due to growing 'IRA influence' ”. Feedback on “The year the Archbishop refused to bless the NYC parade due to growing 'IRA influence' ”.